Our NEW Confetti Machine operates as Plug-N-Play and is a fantastic addition to any event or celebration. It comes with a remote control that controls the machine from a 100′ radius. This unique machine has an adjustable launching port and easy fill confetti receptacle. Call Global Special Effects @ +1.256.229.5551 for freight information. 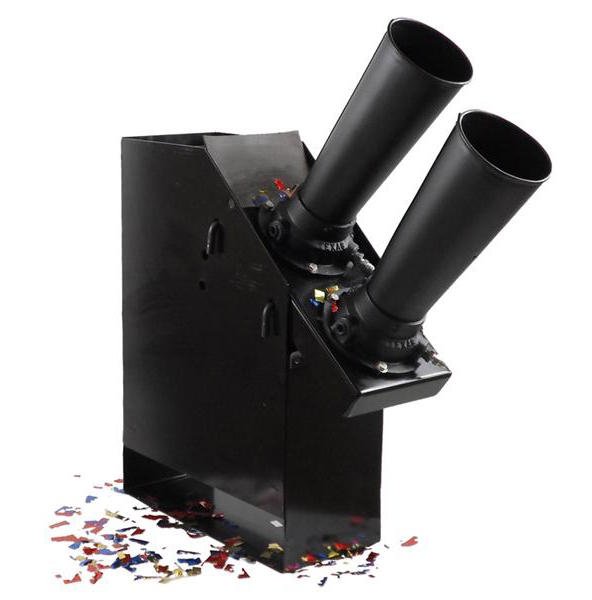 Our 3 inch continuous flow confetti launcher can launch 1-lb. of confetti products per second up to 75′ high. You can use our tissue or metallic Flutter FETTI, our tissue Corkscrews, or our die cut products in this machine. You will need to rent the liquid siphon Co2 tanks in your hometown. Call a company such as AirGas and they can supply you with the liquid sipohn Co2 you’ll need to operate this gerb. It takes either (1) 20lb liquid siphon which will last 20 seconds or (1) 50lb will last approximately 60 seconds. We also carry add on manifolds to accommodate up to 4 tanks! 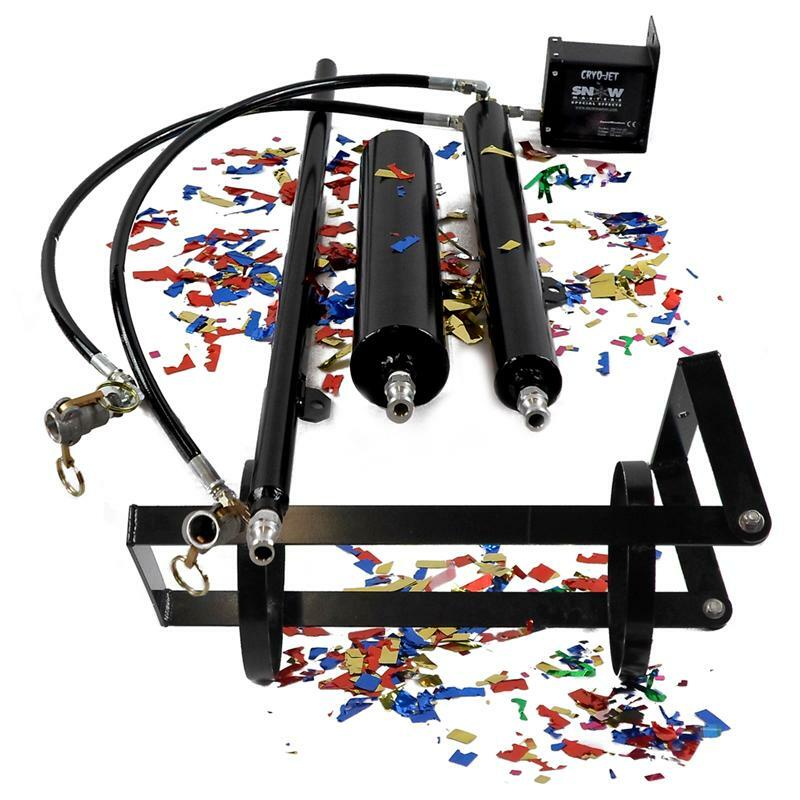 When you rent or purchase our 3-foot continuous flow confetti launcher, all the hoses come with the equipment. 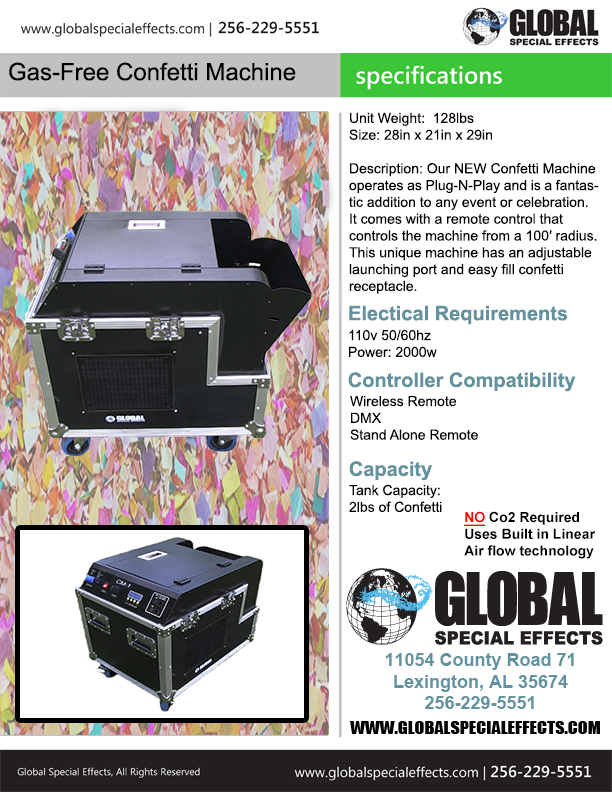 Call Global Special Effects @ +1.256.229.5551 for product specs and freight information. You are now witnessing the most advanced CO2 cannon system ever sold. This bad boy is completely customizable from the ground-up, and it will blow your face off if you’re not careful. We are selling it primarily as a confetti cannon, although it is capable of much more than just confetti… We’ve had reports of people shooting naked hotdogs from the 1″ barrel, wrapped hotdogs in buns from the 2″ barrel, and t-shirts and miniature Nerf footballs from the 3″ barrel! CO2 Jets are a blast for clubs and parties. Make it look cool and cold on any dance floor from 90 degrees to 30 degrees in 6 seconds with our special effects CO2 Cryo-Jet. Instantly create special effect plumes of cryo going up to 30 feet high. Can be hung from a truss or mounted from a wall or the floor. With the push of a button on the CO2 Blaster Master Control (sold separately), create instant CO2 fog, release the control and the fog is gone in seconds. No need to worry about any alarms, as CO2 leaves the room clean. Unit comes with a 30 foot hose to connect to a CO2 tank, all for only $1,500.00 plus shipping. Note: Requires liquid CO2. This is the newest electric solenoid packaged in the protective metal container. 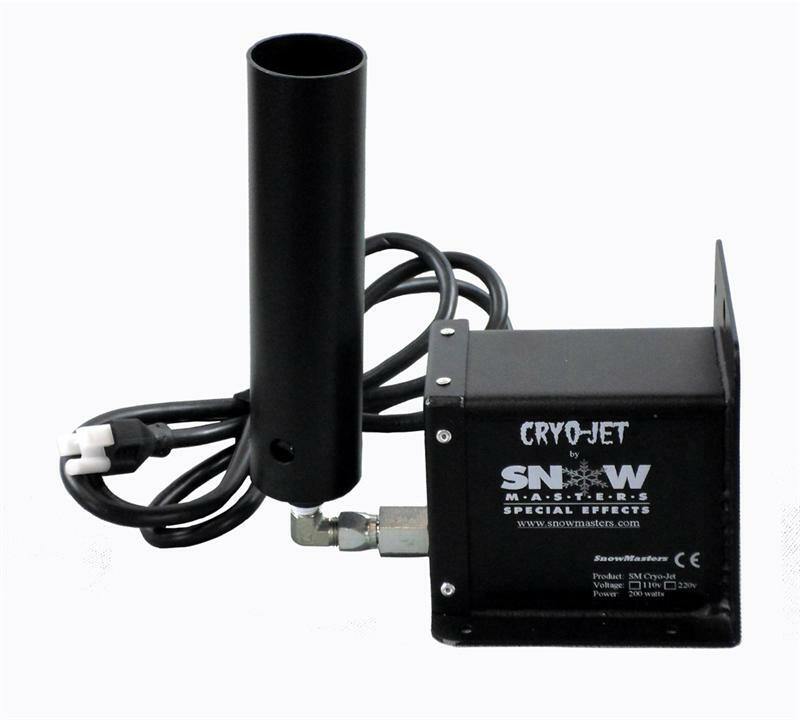 This unit is the hand held version of our very popular Cryo-Jet. 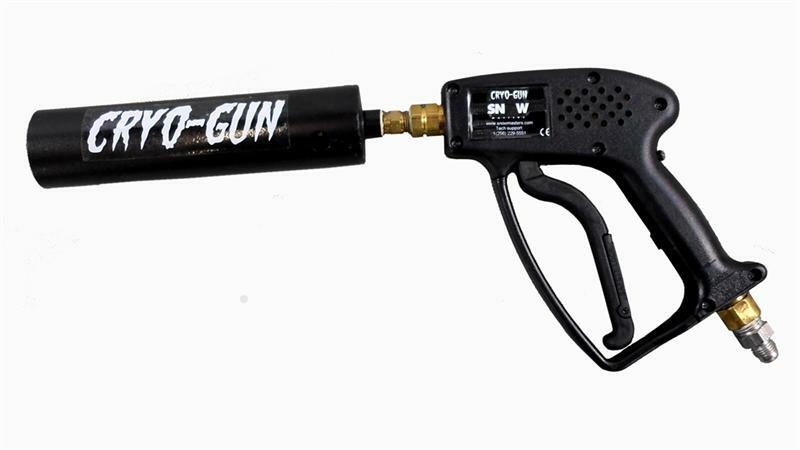 Our Cryo-Gun is easy to set up and even easier to operate. The Cryo-Gun shoots a 15’ x 4’ CO2 plume where ever and whenever the operator wants it. Used in bars, clubs or dances to cool the crowd down in seconds. 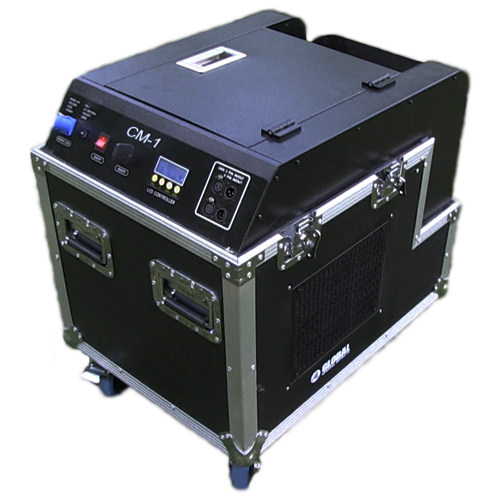 Our Cryo-Gun is also great for that extra little blast from the DJ booth. Also popular in stage productions and theater when the blast is needed in a very specific spot.Note: Requires liquid CO2 Tank Not Provided.